Harry (Daniel Radcliffe) ignores warnings from Dobby the House Elf (voiced by Toby Jones) not to return to Hogwarts, but there he finds the school is plagued by something attacking students and Harry starts hearing a voice that no one else can hear. The Chamber of Secrets is darker in tone compared to its predecessor, but it still has a lot of childlike wonder about it. Just when you think you know everything about Hogwarts, there’s hidden dangers and rooms waiting to be discovered. Some of those dangers include giant animals that no one would want to meet in real life. The scenes at The Burrow, the Weasley’s home, are wonderful. It’s the first chance for both Harry and the audience to see a proper wizarding family’s home and there’s a lot to see; dishes washing themselves and a fascinating clock are just the tip of the iceberg. It’s lovely to see more of the Weasley’s, especially Mrs Weasley (Julie Walters) who is a force of nature but it’s clear she loves her children, and Harry, very much. The young cast have improved since their first outing, though aren’t as good as they grow up to be, but Rupert Grint shows the beginnings of some great comedic timing. They’re still surrounded by some great acting talent and there’s some new faces in the form of Kenneth Branagh as Professor Gilderoy Lockhart. His ego makes him hilarious! Also joining the cast is Jason Isaacs as Lucius Malfoy, Draco’s (Tom Felton) father. He’s an imposing presence, and is both slimy and charming in equal measure. The Chamber of Secrets is probably the most faithful of the adaptations but that does mean it can get a little bogged down with scenes and characters that don’t particularly further the plot. Anything with Dobby though is brilliant. For a computer-generated creature, he’s so emotive and easily likeable, his scenes with Harry are often funny. 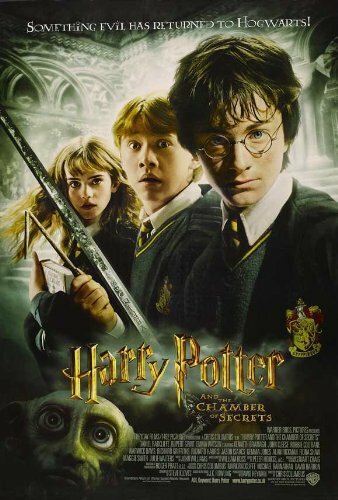 Harry Potter and the Chamber of Secrets starts to raise the stakes as you learn more about Lord Voldemort, but it still feels like there’s a safety net around our young heroes. But that is all about to change very soon. 3/5. I love this film! I was 13 when it was released and I saw it twice at the cinema. Happy memories! And Dobby is brilliant.